As you may have heard – about 9,000 times – most of the winter nights involving Sabre games at the KeyBank Center haven’t rated too high on the entertainment scale. Buffalo has been rather dreary in its home games in 2017-18 in terms of its record. And it’s not as if the games have forced fans to only use the edge of their seats along the way. Let’s thank the Toronto Maple Leafs for changing that, at least for a night. The Sabres and Maple Leafs have had an odd relationship for the past 48 years. The teams are separated by 99 miles or so by highway, so they are natural rivals in that sense. It can be tough to purchase Leafs’ tickets in the Air Canada Centre, so traditionally many Canadians scoop up seats in Buffalo when Toronto’s squad comes to town. This has led to the curious sight of having a building with split loyalties. The Leafs’ fans were lined up for the opening of the gates on Monday night, ready to chant “Go Leafs Go” at the slightest bit of excitement. That tends to amp up the Sabre fans who didn’t sell their tickets at a profit to the invaders. No matter how the two teams are doing, they seem to play entertaining games against each other. Interestingly, it’s been an even split about how the teams compare over the last two decades. Buffalo has had a better record 10 times, while Toronto will make it 10 seasons on top when this campaign comes to an end. On Monday, the teams met for the first time of the season, and this one didn’t have anyone asking for refunds. The Sabres kept their fans happy and Toronto’s fans sad with a good 5-3 win in the KeyBank Center. That’s not to say the game didn’t have some quirks. 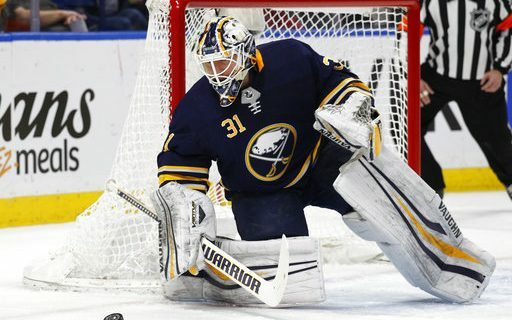 The Sabres, who haven’t had their share of good fortune for much of the season, got about a month’s worth of luck. Rasmus Ristolainen took a pair of shots in the first period, and both of them seemed to bounce around a bit before landing in the net. Sam Reinhart, who had found a home around the net lately in picking up his scoring, and Jason Pominville had the goals. Yes, Buffalo had to be in position to create that luck, but it doesn’t take much for a deflection to go from goal to oh-so-close. Toronto, which had lost three games in a row and thus wasn’t in any mood to be ignored by Lady Luck, answered back. Leo Komarov scored twice to tie the game around the midway point of the second quarter. But instead of collapsing, Buffalo was the team that turned the game around during the rest of the second period. Zemgus Girgensons saw the puck bounce off his skate on a pass by Reinhart and into the net for a 3-2 lead. A few minutes later, a clearing attempt by Toronto tipped off an official’s skate into the slot. Ryan O’Reilly was alone, and he made sure of his shot on goalie Frederik Andersen. Johan Larsson added a little insurance in the third period without the benefit of a break, hustling to get a rebound and sliding it into the vacated net. It was another quality win against a good team in the Sabres’ own division. Buffalo has been a handful for Tampa Bay, Boston and Toronto so far this season, and, shall we say, less than that against the rest of the league. It’s a small silver lining, but it’s something. After the game, the fans and teams went back to their respective home bases. The memories of this one made the night much for pleasant for Buffalo’s side.